So for reasons still unknown I had a brain storm of sorts a few weeks ago that we should try and make homemade Pastrami dogs. Now if you’ve ever been to wienerschnitzel you know what I’m talking about. The picture above pretty much says it all. 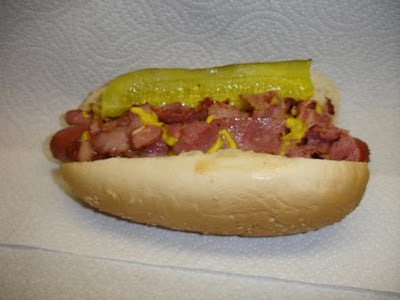 Very simple you take your dog of choice smother it in chopped and slightly stove top grilled pastrami add some pickle and mustard and enjoy. I usually tend to think of the bun as a major part of the experience and I would have chosen something with a little more flavor and flair but Dea reminded me we were on a budget! Now my favorite part of Pastrami is not just the amazing roast beef like quality of it but also that amazing peppery bite you get from the outside spices and brine. I could imagine how all those complex flavors would combine to elevate my all beef ball park hot dog. I was super excited to sink my teeth into it. First bite I rolled around in my mouth for a few seconds and took in all the flavors. The dog was perfect, the mustard had some bite the pickle was vlassicly delicious, but no pepper! It turns out that a quick warm up in the pan managed to kill that delicious roast beef flavor and assassinated all that juicy peppery goodness that makes pastrami what it is. Don’t get me wrong it was a great dog. What flavor the meat imparted was still very good and elevated this child hood staple to a whole new level unfortunately it just falls short of resting on the heavenly mantle of food nirvana. Next time maybe we can find a way to harness those juices and add back in some of that peppery flavor. We will keep you posted. As for whether or not you should try this at home? I would say by all means. In fact I already figured on a few changes. First try some deli mustard instead of classic yellow. Second if mustard isn’t your thing maybe try your favorite barbeque sauce. Third when warming up the pastrami taste if before pulling it, if it needs some more flavor try hitting it with some cracked black pepper. I will say that this is a classic in the making and we will try this one again.